Just setup and tuned my new Samick Red Stag one-piece recurve. Very impressed overall with the build quality and aesthetics of this bow. The really impressive thing is I paid $149 for this bow. Lancaster Archery Supply had the bow on sale so I picked one up. 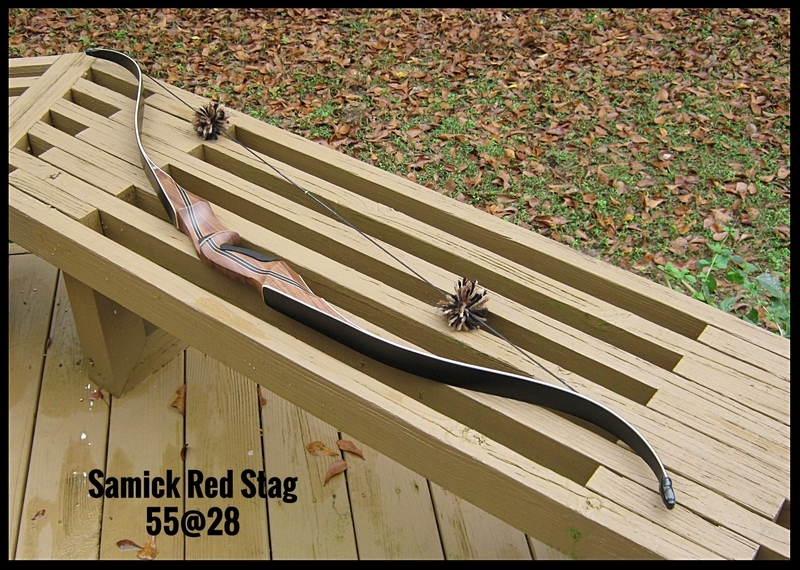 My son shoots a Samick Sage and I have a Red Stag take-down recurve and we have been very pleased with both. I own or have owned several custom bows and while the Samicks are not custom level they are certainly a lot of bow for the money. I only have had a chance to shoot a few arrows so far with the rain this weekend but I am impressed with the bow so far. Its fast and really sticks Easton 2018 Legacy arrows hard. This should make a nice back yard shooter or hunting recurve. Update: I shot around 150 arrow from the Red Stag today. After I got the brace height where I needed it to be the bow performed very well. As accurate as many customs I have owned and no hand shock or perceivable stack at my draw length of 27.5. Its really smooth especially for a bow at this price point. It was a true pleasure to shoot. Looks like a nice little bow. I really like the looks of it over the sage. Hmmm I may need a backup bow. Thanks for the review let us know how it holds. up. My son has been shooting this bow this past year or so. He loves it. It shoots great. Cedars or carbons. He has a 45# Hawkeye by Samick (BW look alike) but prefers the Stag. Like mentioned by Jim above you get a lot of bow for the money. I don't think there's a bow at this the price that can compare. Very nice bow. Samick makes good bows that are highly functional and affordable. It looks sort of like a Martin Hunter. Good luck! I bought the take down version of this bow for my daughter. She likes it and performance seems every bit as good as most other bows. You would have to spend 4x more to notice any difference. I just purchased one! Was I surprised at workmanship and quality. Set it up in minutes!! It is almost as good as some of my $$$$ bows! Great shooter. Good looking bow. Glad you like it.